Start a school they said, it will be great they said! And it is great, but it is SO much work, I feel like I'm treading water daily. Buying needed supplies daily, telling teachers "that will have to wait" daily. Having this school is such a blessing to me personally. As a Mama I'm not having to worry about a teacher hitting our kids. I'm not having to replace school supplies daily because someone stole them. My children aren't threatened daily that they will be hit if XYZ doesn't happen (usually things completely out of their control). The start time and end time of school isn't constantly changing. All of these things were issues for us last year, so starting a school has helped us so much! However I didn't realize how many needs a school has! I didn't know trying to merge our Christian academy ideas, wants and expectations with the Kenyan school way would be so difficult. 😲 Cross-cultural missions can be hard! I knew it would take up time, but I had no clue it would take up this much time, I need about 5 of me. I didn't realize how much my parent and teacher (homeschool Mama for 10+ years) side would come out while directing a school. I didn't know how much this would stretch me. I didn't want to start a school so soon, but it was truly needed. 2 months in and in some ways we are finding our groove and in other ways we are still pushing to get there. There often seems to be a hard line drawn, but no real reason so it takes some talking through things, which isn't always my favorite. I think sometimes people don't think I know what I'm talking about, but usually I won't be adamant about something unless I know. 🤷🏻‍♀️ So here we are just a couple of weeks before we have 3 weeks off, in some ways I'm looking forward to the break and in other ways I feel like it might set us back. We have a decent routine going and I hate to let go of it, but having a more lax schedule is easier for us all. The kids are doing great in school and I expect their report cards to be good! Thank you to all of y'all who pray for this ministry! I never imagined it would grow this much in this short amount of time. We've done some things backwards, but we have been so blessed by that and learned a ton and we are still learning daily. Your prayers and support are invaluable to the work being done here. Just a few Neema Christian Academy kids! Soon we will need a class photo! A little football match during game time! Dickson was feeling better and was at school today. Here he is with his new 1st grade school books. Some of the 3rd grade books. Too sweet of a picture not to share! 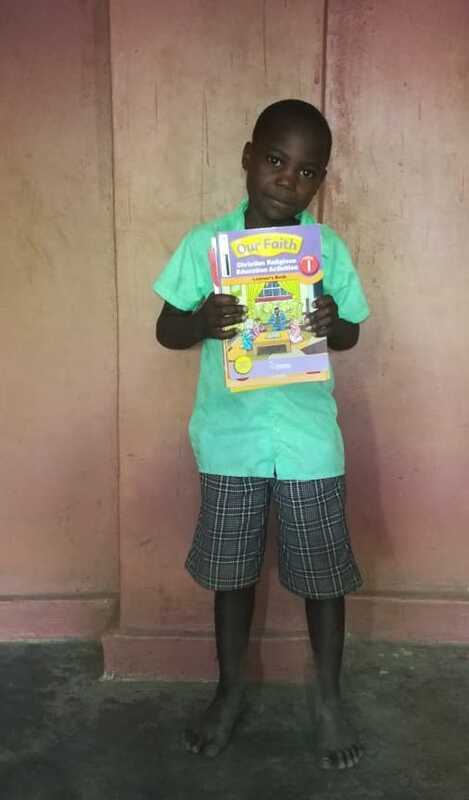 Last week we posted about 3 children who needed to come to Neema Christian Academy. Y'all stepped in and filled the gap for them! All 3 kids are happy to have their books and be attending school! Besides the excitement of them being in school they no longer have to worry about being sent home because their family can't afford school fees. We are doing our best to lead hearts to Jesus, feed hungry bellies, instill a love for reading and learning and lift some of the burden for these children and families. Thank you so much for helping them!